This week I am back at the office even though I am on MC. Have some work with hard deadline to meet. The doc gave me an "open date" for the next appointment. What this means is that I do not need to go back to NUH Clinic B anymore, unless (touch wood) something goes wrong. Total "downtime" is from 28/06/05 to 25/10/07, which works out to be 850 days or 2 years, 3 months and 28 days. Just came back from NUH after the first review. After they removed all the dressing, I realised that I was not totally free from all metal yet. They used staples instead of thread for the stitching. Cool, haven't seen staples up close. Too bad I didn't bring my camera. Anyway, the staples are supposed to be removed only after 10 days, so the next time round I'll bring my cam. After examination, they dressed up the wounds again, this time a much more simple affair, without too much gauze and cotton wool. Its approximately 60 hours since the operation now. Tomorrow there will be the first post-op review. 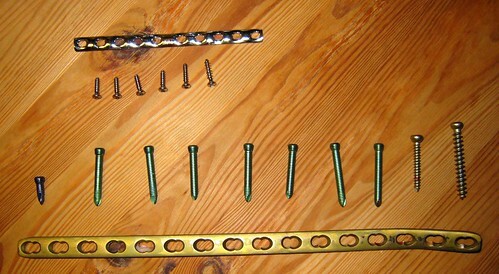 As such, I will be going down to NUH tomorrow afternoon meetup with the orthopaedic surgeon. 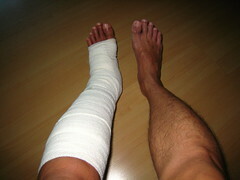 Anyway, the pain is getting less now, it usually comes when I stand too long and when the leg starts getting swollen. I am down to 1 crutch today, and hopefully by weekend it will be no crutches. I have tried walking around without any crutches just now, was ok but can't do it for too long. Think I have to be patient. Will post an update tomorrow after the visit to the hospital. It has been over 2 years since THIS happened to me and they had to fix it like THIS. The orthopaedic has finally given the thumbs up to remove my steel implants in my left Tib/Fib a couple of weeks ago and yesterday was the Operation. Arrived at the NUH Day Surgery Centre (at the newer Kent Ridge wing) at 0715 but it was already pretty crowded. My number was #016 and they were only serving #005. It was almost an hour wait before my turn. After settling the registration, we (wifey and I) were asked to go inside a second waiting room where we waited for about 5 minutes. After that I was given a bed and explanation on the admin procedures. The staff were friendly and professional. They went through the checklist (i.e. my name, NRIC, what op I was doing) at least 5 times by different people at different stations. Anyhow, I was assigned OR1 and had GA administered there probably around 0930. After that I was KO until when I was in the recovery room. By then, the op was done and it was about 1130 when they wheeled me from the recovery room back to the day surgery ward. I will be on MC for 14 days, resting/working at home. I am on 2 crutches now. The pain is not great but can be a bit uncomfortable if I move around too much. Will probably go back to office next week when its less painful to walk. Just came back from Newton catching up with old friends over drinks and some nibbles. Can't believe that we've known each other for 24 years already. Anyway, after coming back, went to take a drink in the kitchen and realised that my neighbour (and maid) are still in the yard doing their laundry ... kinda creepy as its 1:30 am in the morning! eeeks! Went out for lunch today at Holland Village at our favourite Ipoh Hor Fun place. After that, dessert was ice-cream at Cold Rock. It was raining and the weather was cool, perfect for eating ice cream! Basically, what the concept of Cold Rock is ice-cream with various kinds of "mix-ins". You can watch their video HERE. Verdict: Nice but a bit pricey. Went to Takashimaya yesterday intending to get one of those garment steamers, something like THIS. Anyway, there was a pretty helpful sales person there which introduced us to "system irons". 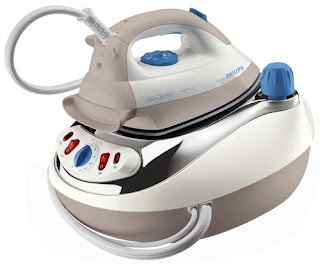 The model we bought was the Philips GC 6360 steam/system iron. It is able to emit steam at up to 4 bar pressure. Tested it out today and it really works. Cut down ironing time by more than half (according to wifey). Also tried to look for a cordless vacuum or electric broom. The electric broom demo was disappointing and the cordless vacuums don't have sufficient power for cleaning the floor. I just discovered that an epilator is a torture device consisting of no less than 10 spinning tweezers looking to grab at any hair (or skin) that they come into contact with! Ouch! After months of planning (or not), we finally moved into our new office on October 1st 2007. The move wasn't the most organised, but still it went pretty smoothly. By the looks of it, our new office is smaller. However, it is conveniently located on the first floor and parking is much less of a problem than our old office. But for those that don't drive, it may be slightly inconvenient as there isn't an MRT station within walking distance so many of them have to take buses. We retained our old cubicles (to save cost) but they were laid out differently. Our cubicles have almost next to no partitioning (i.e. super low). In fact, it is more of a "space" rather than a "cubicle". Because of this, one can almost see the whole office while seated. From where I am seated, due to the direction I am facing and the 2-3 huge pillars in the room, I can only see less than 20% of the entire office (i.e. the entrance, meeting room doors, document/printing centre and 2 other cubicles). The rest of the cubicles are behind my back. So far, I've got the mirror, will install it tomorrow and see if it works! Also, have printed out this picture of a waterfall as well as a personal photo.